Identification: Adults are black, brown, yellow, or green. Enlarged hind legs for jumping. Many have brightly colored underwings. Nymphs are similar but smaller. Biology and life cycle: Female adults deposit masses of elongated eggs in burrows in the soil or on weeds. Eggs hatch in the spring; nymphs grow and molt for forty to sixty days. Adults feed until cold weather. Habitat: Cereals, grasses, and other agricultural crops. Grasshoppers like sterile, unhealthy areas. Feeding habits: Adults chew foliage of many crops. Nymphs like grass. Economic importance: Can destroy crops in a hurry. Insight: Important in the food chain for fish and small animals. Grasshoppers need bare soil for egg laying. Natural control: Natural enemies such as blister beetles, ground beetles, predatory flies, parasitic flies, and especially birds. Beneficial fungi that inhabit healthy soil. 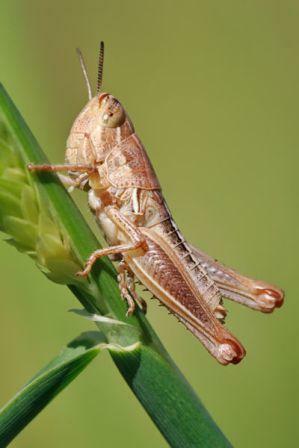 Organic control: Grasshoppers can only be controlled with an organic program. Plant a bio-diverse garden and landscape by using many different plants and encourage the various insect eating animals. Birds are the most important tool of all. Put out and maintain several feeders.Floating row cover or biological controls such as Nosema locustae or Beauvaria bassiana. Build soil health and mulch bare soil. Adding garlic-pepper tea to the mix also helps. Dust the plants with all-purpose flour which forms glue as the insects try to feed. Go organic. Plant a strongly biodiverse garden and landscape - in other words - use lots of different plants and yes, encourage the various insect eating animals. A biological bait, Nosema locustae, is also available and helpful with the overall program. When the humidity is low, dust plants with natural diatomaceous earth. Cover all bare soil with mulch and feed the birds regularly. Once the insects are mature and feeding heavily, a particle film spray is needed. Use 2 cups of the EPA approved kaolin clay in 1 gallon of water with 1 tablespoon liquid soap or yucca extract. A commercial product available is called Surround WP. Raw canola oil can combine with a fungus to get rid of grasshoppers, a researcher says. Stefan Jaronski, who works at the Agricultural Research Service in Sidney, Mont., has found that the raw canola oil has fatty acids that will attract grasshoppers to deadly fungi known as Beauveria bassiana and Metarhizium anisopliae. Note: Apply nosema locustae and beneficial nematodes.